Isn't it about time to get yourself a new ESD-wrist strap? 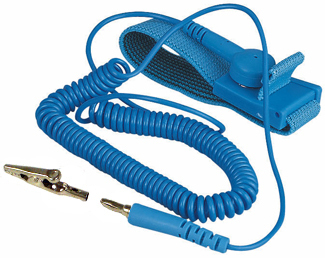 Here's the AT-S-200 ESD-Safe Wrist Strap with a fully size-adjustable, soft comfortable elastic fabric band complete with a swivel banana plug for easy rotation, a full six foot (2 meters) coiled cord, the industry standard 1 Meg Ohm resistor. The wrist strap also has an adjustable locking clasp. Plus we provide an additional removable alligator clip at no extra cost! Complies to Industry Standards including ANSI/ESD 20.20 and MIL-STD-1686 and EIA62 static control Industry standards. Our ESD Wrist Straps provide comfortable protection against static discharges with a continual static "drain" when working with your printed circuits and chips. RoHS Compliant. Learn more about why ESD by scrolling down to the "Background" section below. The AT-S-200 Wrist Strap for ESD Prevention Features a Soft, Comfortable Elastic Fabric Band, A Smooth Nylon Adjustable Clasp, 6 Feet or 2 Meters Coiled Cord, Alligator Clip, 1 Meg Ohm Resistor, 360° Rotating Banana Jack. Background: Static is easily generated by humans from a mere shuffling our shoes across a floor or by movement in our clothes. Static charges build up and we actually store the charge within us. Ever stepped across a carpet in the winter and touched a metal door knob to be jolted? The little jolting sensation and even accompanying crackling sound happens because a stored charge within us is being released or discharged. And this is what is called Electrostatic Discharge (ESD). While the charges that build up within us are not high voltages, they are high enough to quickly and permanently damage sensitive electronics devices used on printed circuit boards (PCB's). ESD-Safe wrist straps (or grounding bracelets) help prevent static discharges which will degrade chips or damage circuits. The ESD wrist strap is made with a fabric woven with conductive filaments in an elastic band that fits upon the wrist of the electronic technician. Conductive fibers within a wrist strap drain static from the technician when the strap is connected to a grounded source such as an ESD mat. This helps prevent discharges and protects your electronic devices. Quality PCB work and soldering ,prototyping, low volume PCB production and rework require ESD protection. An ESD-Safe wrist strap is an essential "tool" for any engineer or technician working with printed circuit board assemblies in today's world of micro electronics. ©1996 - 2011, 2012, 2013, 2014, 2015, 2016, 2019 by Zephyrtronics®. All rights reserved. The information, text, images, photographs, charts, graphs you receive online from Zephyrtronics® are protected by the copyright laws of the United States. The copyright laws prohibit any copying, redistributing, retransmitting, or repurposing of any copyright-protected material. Zephyrtronics is the registered trademark property of JTI, Inc. "The Science of Zephyrtronics" and "Simplicity Through Innovation" and "Zephlux" and "ZeroLead" and "Zero Balling" and "Zero Residue" and "Post Cooling" and "Post Cooler" and "AirBath" and "SolderGlide" and "SolderMill" and "Just So Superior" are the protected trademark property of JTI, Inc. "Zephyrtronics" and "Low Melt" and "Air Fountain" and "Fountainhead" are the registered trademark properties of JTI Inc. *The above names are the registered property of their respective owners.